Yanis Varoufakis’ notorious Plan B is gaining notoriety as Greece’s ex-finance minister now faces criminal charges. Developed with James Galbraith of UT Austin, Plan B outlined the introduction of a "fiscal currency" parallel to the Euro in case of extended gridlock with the Troika. If the ECB cut off Emergency Liquidity Assistance to Greece this parallel currency would relieve Greece's tightened liquidity—and resulting social fallout—during an extended bank holiday. Some still say much ado about nothing but is this really the case? Such supplemental currency is uncharted territory for Eurozone Treaties as it would be denominated in euro and would not represent a new currency or the return to the Drachma. Under Plan B Greece could have introduced a de facto system for accounting and transferred household debt owed to Greece’s tax authority to third parties. 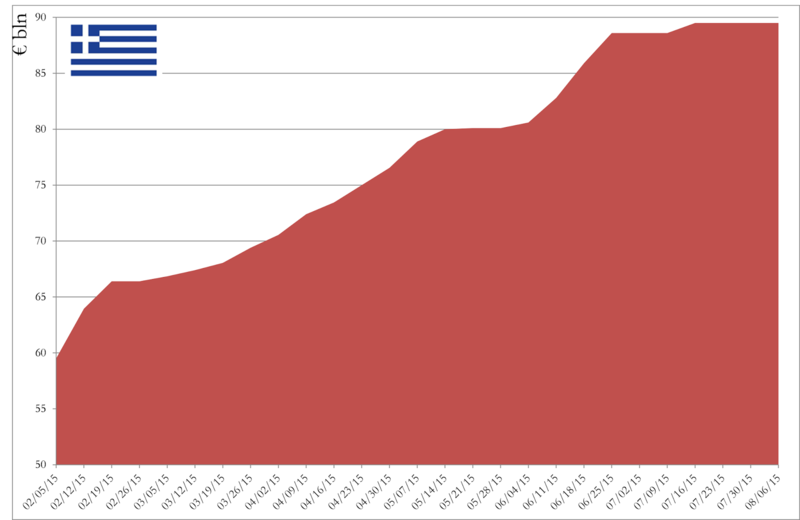 Once this debt is transferable, Greek citizens could use the newly issued currency to settle transactions: citizens could simply transfer debts for goods and services as they do with traditional currencies. Moreover the Varoufakis-Galbraith plan would have allowed residents to exchange new currency for funds otherwise frozen in bank accounts. Consequently, restored financial transactions would have bypassed liquidity issues and the stifling bank holidays. The successful circulation of a fiscal currency depends on household debt owed to the tax authority. Debt-based currency issuance, which depends on substantial household debt owed to the sovereign tax authority, would be particularly effective in Greece given the high level of fiscal indebtedness of its citizens . 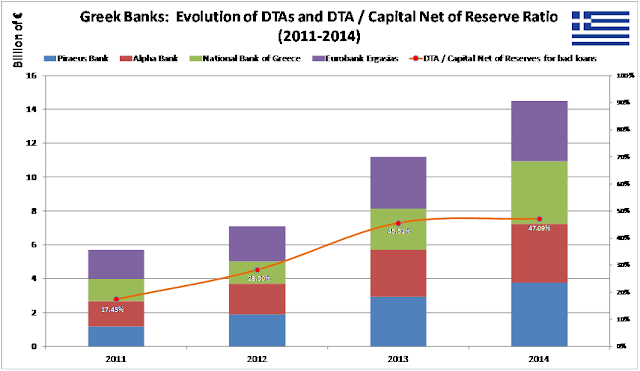 In fact Residents have high fiscal debts and the banking system has recently been recapitalized by about 50% using € 15 billion of Deferred Tax Assets. In other words, such a plan has already been used to keep Greek banks alive and preemptively prevent the Troika from meddling with Greek bank accounts in the future. Similarly, Greece could circulate Public Administration debt owed to the private sector. It is unclear whether Syriza could extend this mechanism to future fiscal debt given the heavy haircut for converting fiscal currency to Euros. To implement the fiscal currency the Greek government would have used taxpayer information available at the General Secretariat on public revenues. While Greece could easily access such information in normal economic conditions, the necessary management software was provided, and likely controlled, by the Troika. Greece’s creditors would obviously prevent their diffusion of a fiscal currency that would allow Athens to take control of their national monetary base. If implemented, the policy measure would both strengthen Greece’s position in the negotiations and any possible plans of last resort. such as the exit from the Euro, less daunting. Varoufakis has recently highlighted that, with a fiscal currency implemented, the return to the Dracma would been realizable with just a "round of a hat". However the fiscal currency is not a panacea: it would preserve public order but not to amend Greece’s contracting GDP, consolidated deflation, and their much-feared consequences on debt servicing. Moreover, the fiscal currency would facilitate domestic transactions but be ineffective for international credit payments such those for public debt (about € 320 billion, 180% of the GDP). The search for a solution to the Greek crisis needs to take a broader perspective. In particular, the Eurozone leadership should seek three goals: reduce sovereign debt spreads between member nations, encourage fiscal transfers that correct financial imbalances and the competitive gaps triggered under the Euro, and help structure effective debt relief for Greece by restructuring at market value. Just recently, this trio helped Puerto Rico reconcile untenable debt, culminating in default. The negative effects on Puerto Rican GDP measured just one third of those on Greece. Although Puerto Rico is only a US territory but not a State of the Federation, it has benefited from federal transfers more than five times the Eurozone allocated to Greece—a member State of the European Union in every respect. While, the FDIC handled Puerto Rico’s banking crisis under the federal budget for more than $ 5 billion, the EU must help Greek banks recapitalize more than € 25 billion at the expense of depositors.